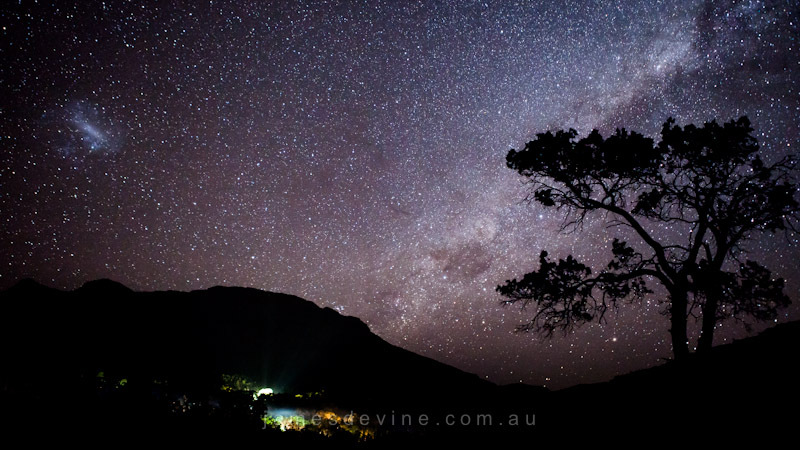 It’s only when one looks upwards on a clear night in the Flinders Ranges, South Australia, that you begin to appreciate our little place in the Universe. With no light pollution from nearby cities to block out the faint light from the Milky Way, the sky puts on a spectacular show. This particular shot was taken just on top of a small hill, right next to the Wilpena Pound Resort, where my newly engaged fiancee & myself were staying. The night before this photo was taken, conditions were far too windy & overcast to get a perfect shot of the night sky. However this time around we were in luck and boy we weren’t disappointed! For the entire night we had a clear open sky & moon below the horizon. Conditions were perfect for capturing the Milky Way and our nearby satellite dwarf galaxy (shown upper left corner of image) the ‘Large Magenllanic Cloud’ (LMC) was in clear view. The shot was taken at 24mm, ISO 2500, 30 Sec exposure, tripod mount @ approx 8pm CST (Aust) facing South West.